Produces a simple plot of the provided Y and Z values over time (X). Requires Kineme GLTools and Kineme StructureTools. This is cool. However I am unable to get it to work inside any macro. For example, trackball. When it is outside the macro it has "queue" as a structure with two hundred members. When it is inside the trackball it has one. I don't know why this happens. So then it doesn't show anything but a blank square of whatever color I set my "clear" to. Other stuff inside the trackball (for example a sphere) works fine. Nice bits of kit you've quietly put in place, smokris. Thanks for some very useful and practical virtual macros indeed. I placed it inside a trackball, and it works for me --- see attached. If you cut-and-pasted it, make sure to set the "Time Scale" and "Samples" values to nonzero (0.5 and 100 respectively work nicely). I also found that after my initial success, having left open the original install macro.qtz [whilst creating a music visualizer incorporating some oscilloscopes in some new .qtz files], that I seemed to have inadvertently messed up the macro and might even have compounded that by re-installing what I can only assume was an altered version of smokris' original virtual macro. What had been pretty regular curves with sin or cos became jagged and oddly quirky. Once all affected files were deleted and replaced with fresh downloads I found that all went well again. Got be careful with virtual macros. Install, then close. Maybe post away , far away, whatever, just don't keep them open once they're installed seems the best way of avoiding polluting their integrity. Kind of off topic, smokris, this reminded me of a standing wave generator you used in visulaisations for the experimental (can we call it skanky?) electronic music festival. Wanted to ask if it is posible you could post that comp or at least point to the construction method so I could replicate. Not sure if it was actually processing audio input or just generating random harmonic type functions but I liked the look of it anyhow. Would be nice juxtaposition for my green laser simulations. Good luck keeping Kineme productive in the future. very cool. thanks smorkis. its like you can buy a real oscilloscope for for a few k or you download this ;). i am really digging the new macro library thing. it seems like a very cool way to protect code if you want to. although im glad you choose to include the macro it worked for me without. 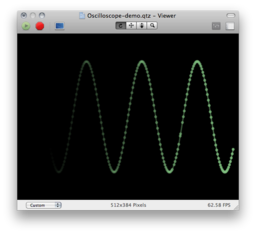 With Oscilloscope, is'it possible to do a X Y stereo PhaseScope, for nice Lissjous waveform?